Robert is a Canadian Artist who lives in Inglewood, Ontario. He was born in Bedfordshire, England, and immigrated to Canada in 1967. He retired in 2002 after a lengthy career as an Aerospace Design Engineer having spent much of his professional life working on a variety of NASA’s Space Programs. However, his love and passion for art have been with him from the time he had the ability to pick up a crayon and scribble. Parallel to his professional career, he has somehow managed to pursue his other love, and along the way, has been very successful in the production and sale of his ink art rendering drawings of streetscapes and buildings of interest around Southern Ontario, often being commissioned for personal projects. 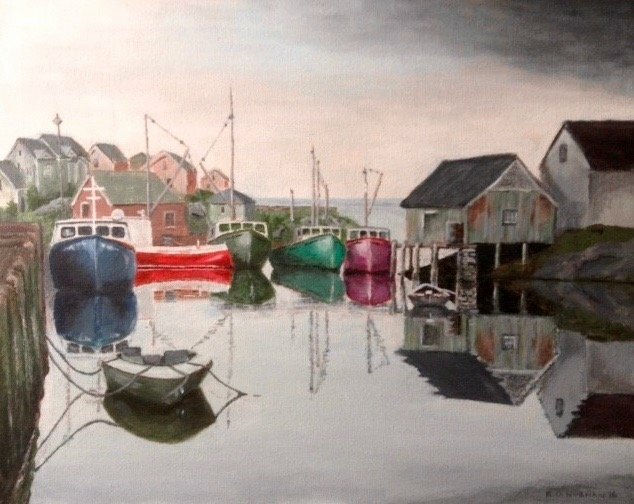 Since his retirement, Robert has had the time and opportunity to consider pursuing other art mediums, and has decided to focus on acrylics which he feels provides him more expression, scope and diversity, and which also adds another chapter to his art. The subjects he chooses to paint are varied, and his style at this time is traditional. He has worked with pencil, charcoal, pastel, watercolour, oil, India ink, mixed media, and now acrylic. Robert is a past member of Headwaters Arts which operates from the Alton Mill Art Centre in Alton, Ontario, and has displayed and sold his artwork during many exhibitions. He is also an Artist Member in the Orangeville Art Group (OAG) Orangeville, Ontario and also has artwork on display at The Queen’s Fancy in Elora, Ontario at the present time.